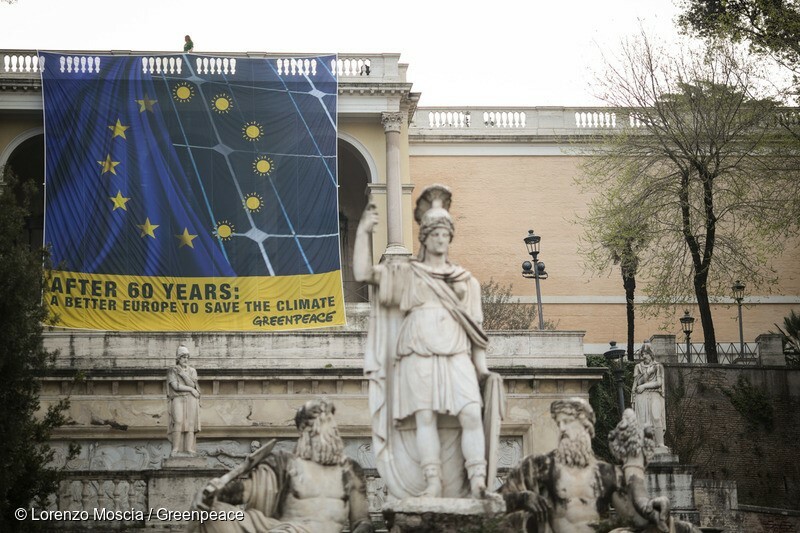 Rome/Brussels – As European leaders prepare to celebrate the foundation of the European Union in Rome 60 years ago, Greenpeace activists kicked off three days of public demonstrations and events by displaying a giant 100m2 banner from a piazza overlooking the centre of the ancient city. Over the next three days, Rome will host dozens of citizen-led debates, protests and exhibitions charting a different course for the European Union. Greenpeace will join people from all over Europe and hundreds of civil society organisations for a march on Saturday in Rome, in support of a united, sustainable and democratic Europe.